The CW has released a clip from tonight’s Arrow 150th episode “Emerald Archer” that looks back at John Diggle (David Ramsey) at a time when the series started. It then moved on to a present-day interview. (We guess since there’s a big ARGUS logo on their building, that the organization isn’t as secretive as it used to be). You can see the clip below; photos and a description for tonight’s show can also be seen underneath it. UPDATE: A second clip has now been released, featuring Oliver and Felicity as William returns home! Find that below as well. 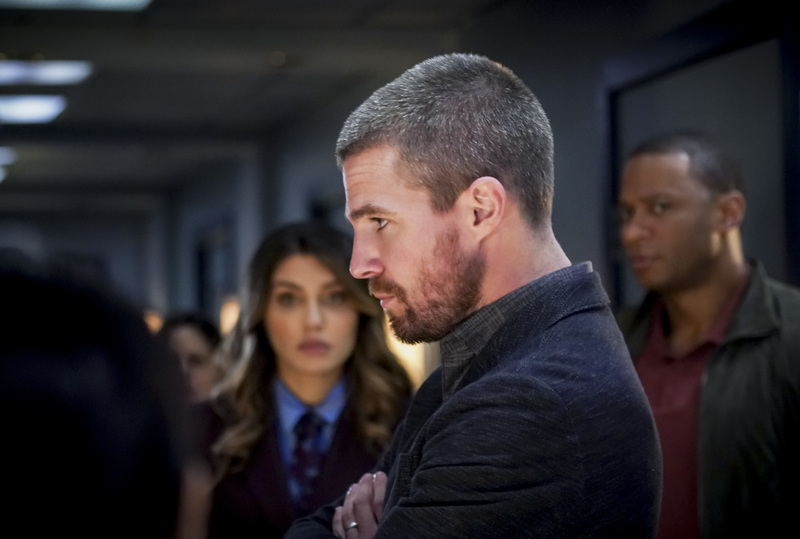 Arrow -- "Emerald Archer" -- Image Number: AR712A_0066b -- Pictured (L-R): Juliana Harkavy as Dinah Drake/Black Canary, Stephen Amell as Oliver Queen/Green Arrow and David Ramsey as John Diggle/Spartan -- Photo: Shane Harvey/The CW -- ÃÂ© 2019 The CW Network, LLC. All Rights Reserved.